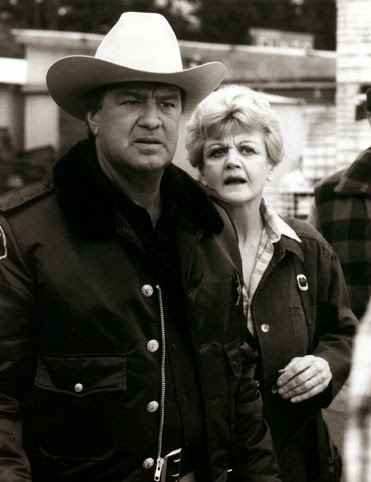 Killer Characters: Introducing Jessica Fletcher...Have you seen this woman before? Introducing Jessica Fletcher...Have you seen this woman before? Hi! 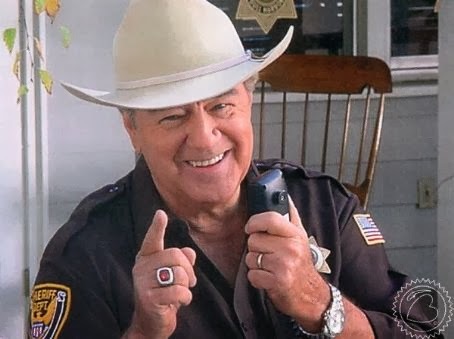 Cabot Cove Sheriff Mort Metzger here. If you were a fan of the television series, “Murder, She Wrote,” in which yours truly actually solves the murders in our small town, admittedly with occasional assistance from my friend, the mystery writer Jessica Fletcher, you might want to take a look at her long-running book series. Donald Bain and Mrs. F. have been writing about her adventures since 1989. If my math is correct, that means that this coming new year, 2014, will mark the 25th anniversary of “Murder, She Wrote” in print. Not bad for a former schoolteacher, which my pal, Mrs. F. was years ago. I usually have crime in our town pretty well under control. But a sheriff in Cabot Cove gets a lot help whether he wants it or not. The rumor mills here are busier than a garbageman sweeping up confetti in Times Square on a windy New Year’s Day. There’s Sassi’s Bakery, Mara’s Luncheonette, the local post office, and I better not forget Loretta’s Beauty Shop. Those ladies (and they’re almost always ladies) have a lot to say about anything that goes down here. Mrs. F. likes to put in her two cents, too. I hate to admit it, but she has her share of pretty good ideas—sometimes. If you’d like to read one of the books I star in, keep an eye out for Mrs. F’s latest, Close-up on Murder. A movie company comes to town and makes my life a living nightmare. And then we find a body. P.S. My wife Adele, who you never saw but whose voice you might have heard on the telephone in the show, decided country life was not for her. She picked up and moved back to the city. I was pretty broken up about my ex leaving until I met and married Maureen. My current wife is a gorgeous redhead who loves to cook. She’s a big fan of those cooking channels that encourage their viewers to experiment in the kitchen. Lucky me! Well...most of the time. There was that cake with the corn nuts on it. There are 40 books in the “Murder, She Wrote” series with three more under contract. The books, original mysteries that have never been televised, are by Jessica Fletcher, a fictional character, and Donald Bain, a real-life one. “Murder, She Wrote” is published by Obsidian, a division of NAL/Penguin. It is among the longest series of books in print based on a television show, and the only one (as far as we know) where all the books are written by the same author. If you want to borrow a book from a library (unless it’s Don’s home library) or buy it from a bookshop, look for “Murder, She Wrote” under F for Fletcher. Go figure! I enjoyedbthe Murder She Wrote tv program. I still watch the reruns when I can find them. It was a great show, Dianne. We hope you'll like the books as well. Thanks, Mary Jane. We're new to this but we'll learn. Same Donald Bain as the gentleman who wrote "Coffee, Tea, or Me"? I wore a couple of copies of that book right on out. Right you are, Shel. We answered you below, but we're happy to acknowledge it again. You're welcome. I think we're finally getting the hang of this. I loved "Murder, She Wrote," so for several years my hubby bought me each season as well as the movies. Now, I have them all, and we both enjoy watching them. I've also read and enjoyed several of the books, but didn't realize there were so many! Will have to buy and read the ones I've missed! 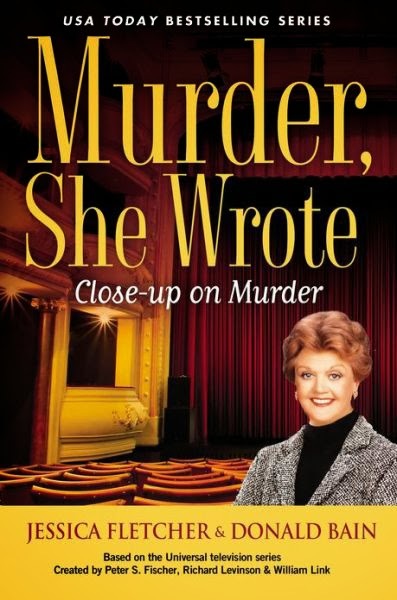 Early congratulations on 25 years of Murder She Wrote books! Looking forward to my "Close-up..."
Thanks so much Dorothy. We're pretty proud of it. Thanks for visiting, everyone. We weren't out shopping on Black Friday; we were hard at work on the next Murder, She Wrote, and neglected to come online. But we're here now and we'll spread the word about this blog. Yes, Shel, it's the same Donald Bain who wrote "Coffee, Tea, or Me." As a matter of fact, one of the MSW mysteries is named in honor of the 60's bestseller, "Coffee, Tea, or Murder." We love the show, too, Dianne and Donna, although our books are not novelizations of any of the episodes, but original mysteries using the characters. Thanks for visiting Mary Jane and Susan. We'll try to be better blog hosts the next time around. Happy Holidays, all! I've seen most of the shows and read most of the books. You do a great job in making each book fresh and keeping the cast in character. Looking forward to the next one. Thanks, Paula. We're working hard on it. I love the show and the books. I have almost all of the books and won't stop until I have them all. When reading the books I can hear the characters speaking in Angela Lansbury's, Ron Masak's and other characters' familiar voices. Thank you so much for writing such wonderful books! Thanks so much, Traci. Don't forget to look for our December 29th posting when we'll be giving away a hardcover for Killer Characters' Season's Readings promotion. I loved the TV show and was thrilled when I discovered your books which do such a great job of capturing the personality of the characters we love so much. I haven't been reading them for QUITE 25 years but I know I was reading them by the early to mid 1990s so I wasn't too far behind and it meant I had a few books to catch up on as opposed to anxiously awaiting the next book every Oct. and April :) Happy Anniversary and thank you for many hours of enjoyment! How lovely to hear, Kelly. We can't believe it's been 25 years. Happy Holidays to all of you, and thank you for reading this post and "Murder, She Wrote." My wife and I have rediscovered Murder She Wrote on Netflix and being under 30 have been humorously riducled for it. I was unaware that you have written original novels based on the lovable characters. I love a good whodunit and cant wait to start reading. My wife and I have rediscovered Murder She Wrote on Netflix and being under 30 have put up with some humorous ribbing for it. LOL. WE both love the Whodunits and I certainly love my Agatha Christie I cant wait to start your books based on thr lovable characters. So excited!! Yes, I remember very well when my father wrote Coffee, Tea or Me when I was a little girl. He wrote that book in the basement of our little modest home in Carle Place, New York. And thanks Dorothy Parker, yes, 25 years! I wrote three of the Murder, She Wrote books with my father, Donald Bain, during those 25 years so I surely am celebrating, of course. Thank you! Yes, I sure do remember when my father wrote Coffee, Tea or Me in the basement of our little modest home in Westbury, NY. I was a little girl when he wrote it. And thank you so much readers for the good wishes for the 25 anniversary. I co-wrote three of the Murder, She Wrote novels with my father so I am surely celebrating. In fact, I wrote Manhattans and Murder which was the second book in the series way at the beginning when dad started writing them. So, surely I have been celebrating the 25 years. And I have several speaking engagements lined up for after Christmas so I'll keep you posted. Thanks again.